NYU—A recent findings could lead to antibiotics that target Rho, a key regulatory protein in E. coli and many other bacteria. The study by researchers at the NYU Langone Medical Center—published in Nature—reveals a new paradigm to understand the molecular principles of gene transcription. Rho, discovered in 1969, is the first transcription termination factor described in bacteria and other organisms. It acts as a red light to gene transcription and is essential for survival in many bacterial species. But the actual mechanism by which it works has been unknown. It was postulated that Rho loads onto RNA at a specific site and then translocates along the nascent transcript in pursuit of the moving RNA polymerase that is in the process of RNA synthesis. 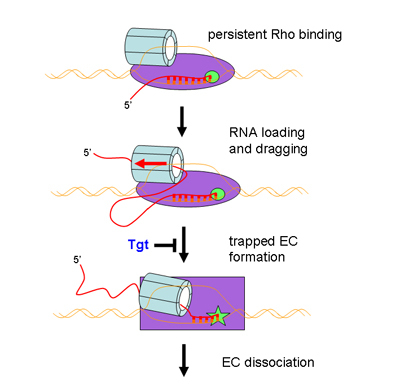 Once the RNA polymerase is paused, Rho has the chance to catch up and terminate transcription. In the new study, researchers challenge this paradigm and provide a completely new mechanism of the Rho termination process. The work provides compelling experimental evidence against previously proposed “passive” models of Rho termination. Instead, researchers present direct evidence for an allosteric mechanism in which specific conformational changes in RNA polymerase catalytic center are responsible for Rho termination. This model offers a general conceptual framework from which to understand the molecular principles of all termination mechanisms. In addition, the study shows that Rho binds tightly to RNA polymerase throughout the transcription cycle, both in vitro and in vivo. This implies that Rho acts like a “subunit” of RNA polymerase that switches to the termination mode as soon as a sufficiently long segment of unprotected transcript emerges from RNA polymerase onto which Rho can load. In the study published by Nudler and coworkers last year in Science, the researchers used antibiotic bicyclomycin, which specifically target Rho to uncover the functional role of this termination factor in the cell. They found that Rho was responsible for controlling the expression of almost every gene in E.coli, by adjusting the overall transcriptional yield to cellular needs. They also discovered that Rho plays a critical role in protecting bacteria from the toxic effects of so called “horizontally transferred” genes—for example, genes that bacteria picked up from viruses and other bacteria. 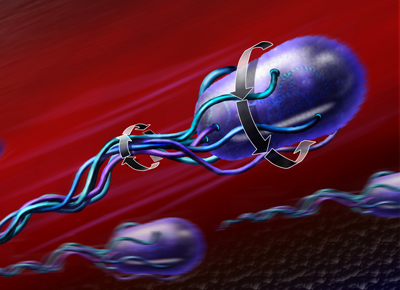 Many of those genes make bacteria resistant to antibiotics. Researchers from NYU and the University at Albany contributed to the work, which was supported by a grant from the National Institutes of Health.